Whoa, wait! What’s going on? Sad Genchu in the snow? This is not where last we left him! Also, I’m rather excited for this scene, it’ll be kind of awesome, I think! Exclamation point! Those are the most endangered wolves I’ve ever seen. Genchu – Two against one? Doesn’t seem very fair. You sure you don’t want to call in more of your pals? I’d challenge you to a duel, but there’s not enough of you. I’m thinking those are Ryoshi’s dogs, not wolves. We may be about to learn why Ryoshi has “retired” from the Demons of Sorrow. Yeah, I went back and looked and there’s a curled shiba inu tail visible in the last panel: Ryoushi’s hunting dogs. I half expected him to GRRRRRWLLLL back. Looking forward to this scene! Once they’re all extinct at Genchu’s blade, the price will skyrocket. Was it winter in the last panels? Did I miss something here? You missed nothing, sir! All will be explained very soon-ish. I’m thinking far back prequel. He lacks the scar and even looks much younger. So maybe how he ended up a member of two clans. 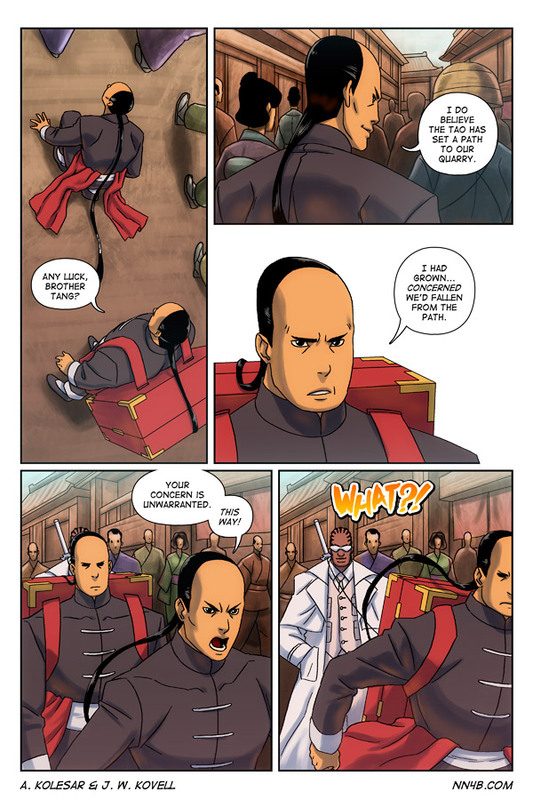 Of course… we would still be left wondering how he ended up with that awesome set of swords if he’s presently little more than a wondering Ronin. Swords don’t naturally make SHING noises when you unsheathe them??? Movies have been lying to me for decades!!!! No, my childhood! Next we’ll find out that control panels don’t emit showers of sparks when you shoot them, or that elevators don’t close when someone’s blocking the door, or that people who fall to their deaths make some sound other than the Wilhelm scream! I find your reasoning sound. Genchu’s got a feral streak to him, after all! Wandering Ronin in the snow… You sir understand badass. I’m gonna take that compliment and run with it. Joe and I have been thinking about this scene for quite some time. Is this one of those dream sequences that end abruptly with Genchu waking up, grunts and then goes looking for the morning tea blend? 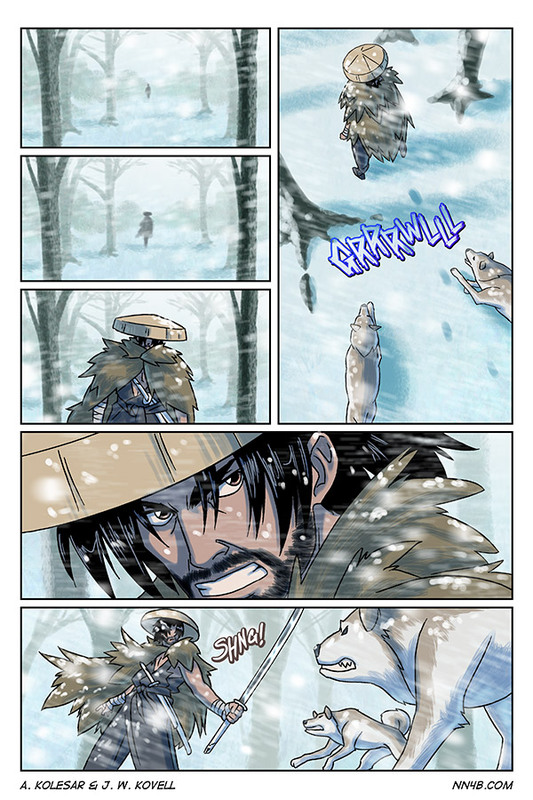 It ain’t a comic about samurai until you have a grizzled swordsman wandering through the snow in a straw hat and cloak. I think that’s article 55 subsection B of the Jidaigeki Codex. There was a bonus rewrite of this page, but now I can’t find it. A little help, please? Wait… Did Genchu used to work for the hot dog vendor? Ah, good. Skyrim wolves. He’ll be eating wolf haunches today.